The Institute for Human and Machine Cognition (IHMC) in sunny Pensacola, Florida is looking to hire new team members for its DARPA Robotics Challenge and Robotic Exoskeleton teams. Team IHMC was the second place finisher in the DARPA Robotics Challenge Trials, held in December 2014. We are now working on the final phase of the DRC, which involves getting the Boston Dynamics Atlas humanoid robot to perform a series of real world challenges in a disaster response scenario. We are looking to hire several talented, motivated, and competitive individuals for a variety of engineering positions to help IHMC continue its success in this program. Long term, short term, post-doc, and internship positions are all available. Humanoid manipulation expert. Ideal candidate is an expert in robot manipulation who has experience with real robot hardware. The DARPA Robotics Challenge requires tackling several interesting manipulation problems, including picking debris off the ground, turning valves, using tools, and driving a vehicle. Robot localization expert. Ideal candidate has extensive experience developing and implementing robot localization algorithms, which use Lidar sensors. The next phase of the DRC will have long periods of communication drop outs, meaning the robot must be able to continue operating without human involvement. A key necessity then becomes good localization. DevOps engineer. Ideal candidate has extensive experience with continuous integration and continuous delivery of Java software. We are always improving our continuous integration pipeline and are looking for someone with the experience and passion to take our software delivery to the next level. We use various build automation tools including Gradle and most of the Atlassian tools including Bamboo, Clover, Jira, FishEye, and Stash. Humanoid walking and whole body motion control algorithm expert. Ideal candidate will have significant experience developing and implementing algorithms for whole body motion control of legged robots. In this phase of the DRC, it will be important to perform whole body tasks, such as climbing a ladder and getting out of a vehicle. Software testing expert. Ideal candidate has extensive experience with JUnit unit testing, continuous build servers, and other Java testing and development tools. Team IHMC is test obsessed and is looking for someone who is just plain test insane. Robot control algorithm software developer. Ideal candidate has extensive experience developing and implementing various algorithms for controlling robots, with as strong background in robot kinematics, dynamics, and control theory. Internships. Internships are available for students that are currently pursuing an undergraduate or graduate degree in engineering, and looking to take some time off from classes, or time off between degrees to work on an exciting project. We require that interns spend a minimum of 4 months at IHMC, but longer term, e.g. 6 to 9 months, internships are preferable. For all positions, ideal candidate should have the ability to write clean code in Java to the highest standards, have an understanding of advanced object-oriented programming concepts, and have excellent analytical, problem solving and organizational skills. Applicants must have excellent communication and documentation skills, be self-motivated and function with little micro-management, thriving in both a team and individual environment. Please note that the Java programming challenge is difficult and has a time limit of 16 hours to complete it. The challenge contains some straightforward robotics problems, as well as some more complex programming challenges. The challenge cannot be paused, so only begin it when you are ready and have allotted adequate time and brainpower to complete the challenge. In addition, you will be asked to upload your resume to the site during the challenge. This job posting will be active until January 1, 2015, or until all available positions are filled. 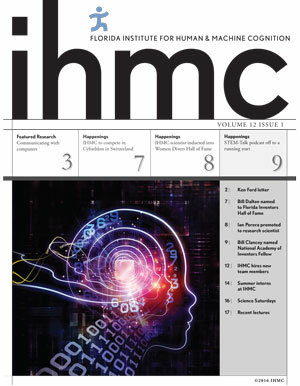 Newer:IHMC Robotics Announces Open Source InitiativeOlder:Open House!